It’s the end of May and for me, it’s a favorite time of year because my peonies are blooming!!! 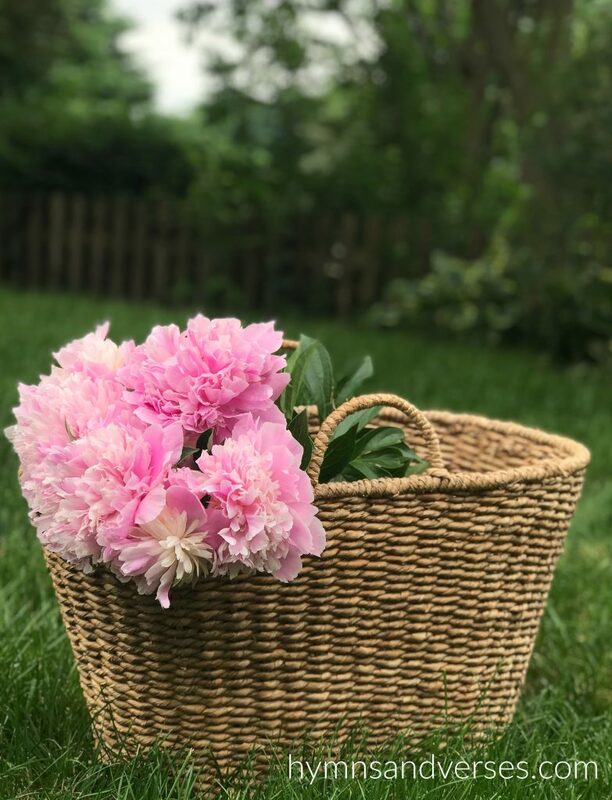 Peonies are an old fashioned favorite that remind me of both of my grandmothers, who had mounds of these gorgeous blooms each year! My peonies are some of the first flowers I planted when we purchased this home about 20 years ago, and I would love to add more varieties soon. 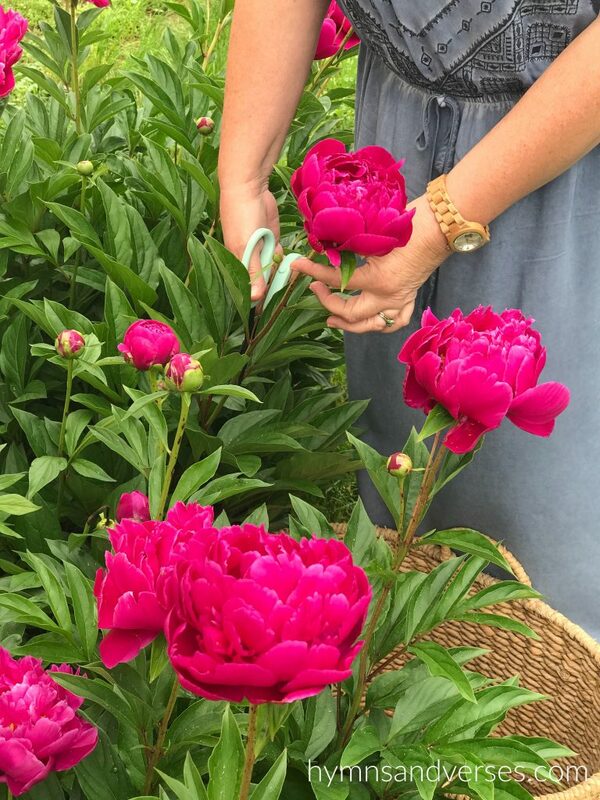 Today, I thought I’d share the tips for growing peonies that I’ve learned over the years! This post contains some affiliate links for your convenience. Please see my full disclosure page HERE. Make sure you plant your peonies where they will get full sun! A perennial is a plant that comes back year after year and are my favorite! You plant once, and reap the reward of pretty blooms each season! New peony plants take some time to get established. If you get a peony plant from your local nursery and it doesn’t bloom this year, don’t be discouraged. Peonies just take some time to put on their best show. The best time to plant is early spring or fall. I’ve planted all of my peonies in the early spring. Those pesky little critters absolutely love peonies, which is why you should plant your peonies a little bit away from your house entries. The side of the house would be fine, which is where I have my pink peonies. My fusia pink peonies are on the side of our garden shed, which is at the back of our yard. If you cut your blooms to bring inside, just give them a shake to remove the ants. If some still linger once inside, dunk the bloom head into some water and rinse those critters down the drain! Peony bloom time is short. Peony bloom time is sadly very short – like a week or two. But, they are oh so gorgeous and worthy of having just for that small window! Peonies are the perfect flower for a May wedding. 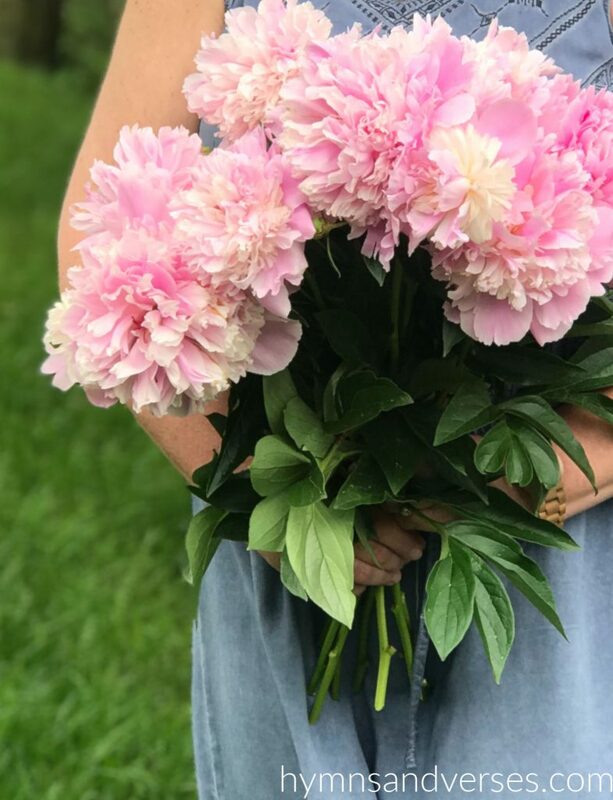 My friend’s daughter got married around this time three years ago and we made her bouquet and attendant’s bouquets with peonies from our gardens and other flowers. Those bouquets were gorgeous! When your peonies are finished blooming for the season, just deadhead (clip off the faded flowers) with your garden pruning sheers. The peony foliage will stay nice throughout the summer. In the fall, just trim the foliage down to ground level. 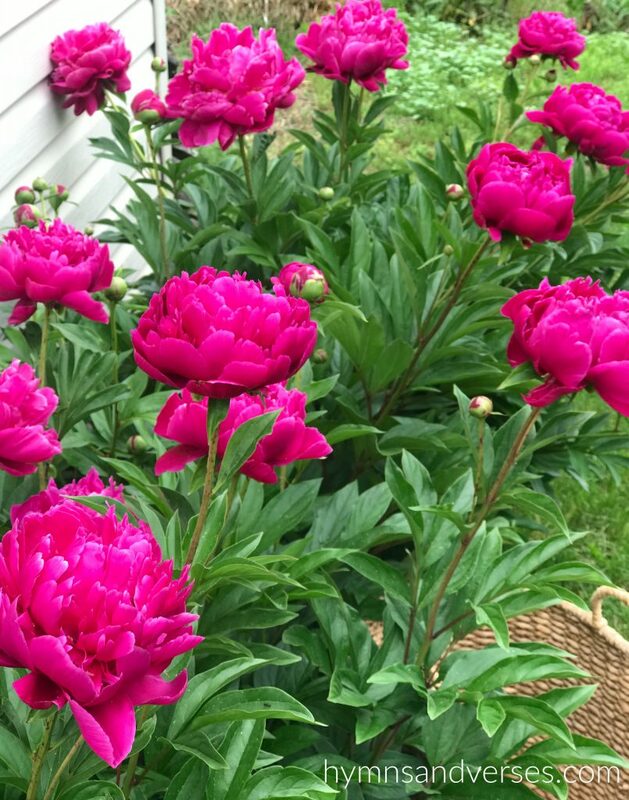 True story – my father used to run his riding lawn mower over my grandmother’s peonies in the fall and they came back more beautiful year after year! They are a strong plant and hard to kill!!! Where to get peony plants. If you are looking for peonies for your garden, you can find them at a garden center, of course. But, why not ask a friend or family member who has some established peonies to divide their established plant and share with you. I love that a lot of my flower garden plants were given to me by friends and neighbors! If you transplant a divided peony, just make sure you water well daily for a week. I have found this product to be really helpful with transplants. Peonies mature to be tall and the flowers can be quite large. So, you may need to support your peonies with garden twine or a support like this or several of these for individual stems. I use the individual supports because I usually only have a few stems that fall over. It really depends on your plant. I hope you’ve enjoyed this post all about growing peonies! I’d love to hear if you have any peonies growing in your garden and what color/variety they are! And, if you have a question about growing peonies that I didn’t cover, please don’t hesitate to ask it in the comments section and I’ll be sure to get back to you! I love peonies also. Three years ago August we moved to this current house which was new and had no landscaping. My husband and I have been planting trees, shrubs, and perennials since that time. I had many peonies at my last resident and so far have planted four here. Two bloomed heavily this year. Unfortunately one (dark rose) did not have any fragrance but the other (pink) did. I plan on planting many others. My peonies didn’t have as many blooms this year… is there anything I can do to encourage more blooms next year? mine is the same. last year I had about 25 blooms and this year I had ONE. Any advice? Did you have a harsh winter where you live? Also, is there more shade in the area this year for some reason – a tree that has grown and is giving more shade or a new building? Peonies did not used to grow in my zone. The last year I noticed more for my zone. Oh I’d love some just to have the delight of the blooms for that window in time! I did not know about ants! where do you live? I live in fairbanks alaska with winters as cold as -60 and i have 4 bushes that my mother in law planted over 10 years ago. They are pretty hardy!! I’m in Pennsylvania! That’s great that they are doing well in Alaska! I’m unfortunate to have colourful blooms this year! And would love to decorate my villa patio with peonies. Would you suggest something to make it bloom like before? Unfortunately this post didn’t teachme much. Most things were obvious statements. Can you tell us about TRE PEONIES.CAN WE DIVIDE THEM. From what I understand, a Tree Peony, is a woody shrub type peony and I don’t believe it could be divided. I would check with your local garden center or where you purchased it for more information. I have 10 peonies and the first 2 years they were not well but this year they’re gorgeous! I’m in northern New Jersey. My grandfather use to tell me whenever I would plant something new and I found it so true. I would like to share it…The first year you plant they sleep, the second year they creep and the third year they leap. Thanks to all my fellow gradners, plant a couple of peonies you won’t regret it. I love peonies and just received my first plant this year for my birthday! I love the colors of yours! ThankYou for sharing- I definitely can put your tips to use! :) Happy Weekend! Hi Doreen, thank you for your wonderful tips, but will they work for me? I live in a small apartment with a large deck that gets a lot of sun all day. I wanted to experience the beauty of having my own peonies. So I’ve planted my bulbs in a extra large and deep pot. So far I see leaves on two of them, do you think they’ll make it and one day I’ll have my very on big beautiful peonies? Hello, and thank you for the tips. My question is I got bulbs (peoies) and they don’t seem to be very healthy looking plants. Do you have any tips for me? If they don’t perform, I would send them back to where you purchased them and get a refund. I have a peony that is planted in full sun at the back of my yard. Each year it is full of blooms. But! They never open fully. I notice a few ants but not enough to help the blooms open. The peonies I had in Michigan were covered with ants. Guess Colorado ants don’t like peony plants! Any suggestions? Hi, Lynne. This is curious! I don’t think it is the ants. From what I’ve read, the ants don’t actually have a bearing on how the plant performs. I’d snip off one of the blooms and take it to a local nursery to get their opinion. That way someone can see the actual bloom half open and may be able to help more. I planted mine 3 years ago from root. It came up a little larger every year. This year it bloomed wonderful magenta colored peonies. My grandmother had them and I always loved them and wanted some of my own. That’s awesome! I’m the same – my grandmother’s loved their peonies and I always think of them when my peonies are in bloom! I have a new peony root in the ground. I put it in about the 2nd week of May. It’s early June now and I haven’t seen any green pop up. I peeked. I dug in and the root has one yellow thick shoot. I pointed it to lay sideways and the cut end of the root is still upwards. I don’t know whether I am seeing a root or a shoot. I have been watering it well. I wonder if I’m over watering a dry root? Any pointers for a brand new peony start? Oh my, Vicki. This doesn’t sound good. I would dig it up and take it to a local garden center and ask an expert. Can you speak to the results grown of peonies bought at say a Wal-Mart garden center? I think they would be fine. I’ve gotten a few plants from the Walmart garden center and they’ve done well. Deer resistant????? I have many deer and they eat mostly everything!!! From what I’ve read, it sounds like peonies are deer resistant because the deer don’t like the smell! Give them a try! Yes, they can absolutely be transplanted! That’s how I got most of mine! It is always best to transplant in early fall or early spring when the temps aren’t too hot. It’s much less stress on the plant. This is the perfect time to transplant!!! Just make sure they have enough sun where you move them! I am obsessed with peonies. 4 tree peonies 6 herbaceous and 1 intersectional. All performing with flying colours. Except for 2 most of mine are in a semi sun/shade area. Find they last longer, colour more vibrant and protected from strong wind and rain. Very resilient plants. Highly recommend for a spectacular show of colour even if short lived. lovely information, thank you. I have grown some peony from seed and am wondering will they eventually flower. any thoughts on this please? Yes, they should be fine. It takes them a while to get established, especially from seed! Where I live our credit union has a fern leaf peony I have never seen any at any garden shops.Are they really rarewould really like to have one the flowers are bright red. Thank you for your article on peonies. I love them. My mom had them when I was a child and I have 4 of my own now. I have grown roses for years and was heart broken when I had to pull all of my rose bushes due to a disease called rose rosette. I recently fell in love with peonies and want to try to grow them. I bought a package of 3 bulbs, one being dead when I opened, one dying in the ground, and one that I am fighting to keep alive. I pulled it out of the ground and put it in a pot on my patio. I live in the North Dallas area where the sun gets intense. I would really love some advise on how to grow peonies successfully in the Texas heat. Thank you the information you have shared. I would like to grow peonies and would love some suggestions on how to grow them in the North Texas sun. I had one planted where it was in the morning sun only and did not seem to be doing well so I dug it up and put in a pot on my covered patio. Any advice on zones 8/8a would be great. Yes, I love my peonies, too and have different varieties in my garden. I live in S. Ontario and in spring when I see them starting to sprout, I insert tomato cages around the peony plant, this way when the plant starts to grow tall and flowers are heavy, the cage is supporting it and it’s hidden too. I have a 2 peonies in my front yard. A light pink one and a fushia looking one. They only get full sun in the mid to late afternoon. They’re both relatively small plants but this year I had 40 or more blooms on my light pink one. I tried supporting the stems but they still fell over and brought down the supports with them, each stem had 3 to 4 blooms per stem. Any advice on how to hold up the stems. I have grown my Peonies on the west side of my house- they are semi shaded at times of the day in Saskatchewan. I will be moving and am wondering when the best time is to transplant them? I understand that there may not be blooms for several years! I have had great luck with my Peonies- and many bouquets. There were not as many blooms this spring but then we had a hot spring. It really depends on the climate where you live. Here in the Northeast, I would transplant in the Fall season before the ground freezes. Love my peonies. Planted last year, from walmart, as a already mature flowering plant. I had a modest blooms last year but this year they went crazy 24 bloom and absolutely Gorgeous! Wish i could share photos. That’s awesome, Krista! They are so beautiful!!! Are certain varieties of peonies more suited for SC? We live the piedmont area and it gets pretty hot here I. Full sun. Your Peonies are beautiful. We had them when we lived in Oklahoma but here in Texas we can’t. I have my peonies planted in my flower bed but the are not doing well at all, should I move them. Yes, I would try moving them to a place where they will get more sunlight!